Only fifteen years before his 1980 campaign, Ronald Reagan blasted students on California’s campuses as “malcontents, beatniks, and filthy speech advocates.” But it was just a few years later that Hunter S. Thompson, citing “that maddening ‘FOUR MORE YEARS!’ chant from the Nixon Youth gallery in the convention hall,” heard the voices of those beatniks’ coevals who would become some of Reagan’s staunchest supporters. It is this cadre of young conservatives, more muted in the histories than the so-called Silent Majority, that this book brings to the fore. 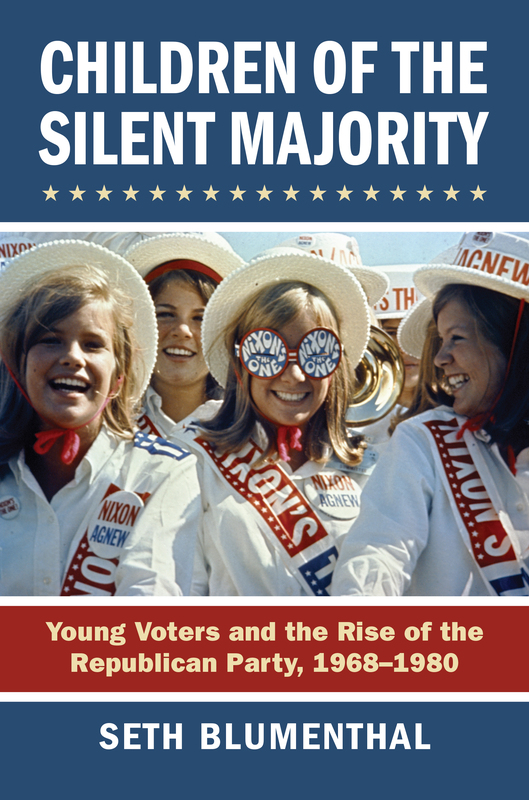 In Children of the Silent Majority Seth Blumenthal explains how, under Nixon, the Republican Party built its majority after 1968 with a forward-thinking, innovative appeal to young voters and leaders. Describing a complex network of influence, Blumenthal examines the role of youth in courting white ethnic, urban voters and, in turn, the role of race and education in the GOP’s targeted approach to young voters. He also considers the prominence of young moderate Republicans in the Nixon presidency as well as the importance of young voters in shaping Nixon’s policies on marijuana, the environment, and the draft. While pollsters, pundits, and politicians of the time expected youth to lean left, Nixon’s surprising effort established a model for a youth campaign that successfully shaped GOP strategy and operations throughout the 1980s. Identifying and defining that effort, Children of the Silent Majority captures a turning point in partisan politics and Republican fortunes and examines a critical moment in the growing importance of image in modern politics. The book suggests a new way of appraising and understanding the significance of young voters in elections and in American political life. Seth Blumenthal is a senior lecturer at Boston University’s College of Arts and Sciences. His work has appeared in the Journal of Policy History and The Sixties: A Journal of History, Politics and Culture.